100% of the proceeds go towards the Save the Giants conservation initiative in Guyana, South America. Please visit: Save the Giants.org for more information! 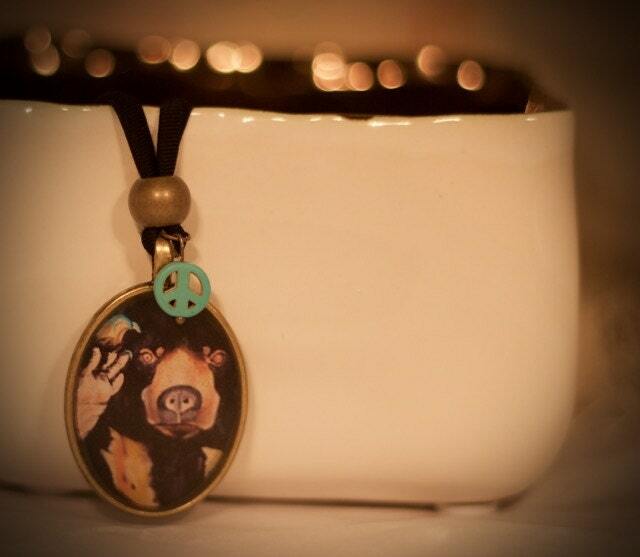 I can't think of a better combo...sun bears + peace. :) Original sun bear artwork. Pendant size is roughly 1.75in x1.25in and the necklace itself is elastic, cotton cording, aprox. 20" in length and finished on the ends with lobster claw clasps. Custom orders are welcome! I can do any color cording and charms that you would like, as well as the size and style of the pendant itself.